200 towns drawn, only 34 to go! Today we headed south to Rindge, on the border with Massachusetts, to fill in a hole in my coverage of that part of the state and to score town #200 in my quest to draw all 234 towns in New Hampshire. The area around the Town Green was so rich with architectural diversity. The drawing isn’t finished yet, but I’ll be posting it here soon. Here I am starting out, with the Ingalls Memorial Library on the right, the town offices in the background, and an unidentified but intriguing building in the center. And where better than the bandstand to proclaim the conclusion of the afternoon’s effort! The big news for the upcoming couple of weeks is that I’m going to be interviewed by Channel 9’s New Hampshire Chronicle, a real institution here in the Granite State. They learned of my Draw-NH! project and think that it will fit well with the kind of things they like to highlight. They’ll be here at my studio on Wednesday, followed by more activity at the Market on the Green that afternoon. And the following week they’ll accompany me on an on-the-scene drawing expedition at the Robert Frost farm in Derry. We don’t yet know which of the people associated with the show will be doing the interview, or when it will actually air. Stay tuned! I am going to focus almost entirely on general stores in this month’s blog post. They are fixtures in small towns in New Hampshire. In our last road trip we learned of two village stores that had been saved by the local inhabitants. 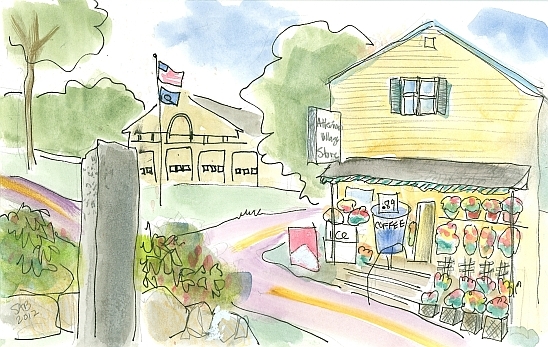 Here in Freedom, NH is the Freedom Village Store. It is built of wood, and of Victorian design. It was built about a century ago, thrived for a long time, then went empty and forlorn. In 2009 it was reopened as a non-profit space. I didn’t have much time to spend there, but it looks worth a return visit. It is a true community center, with food, and art. 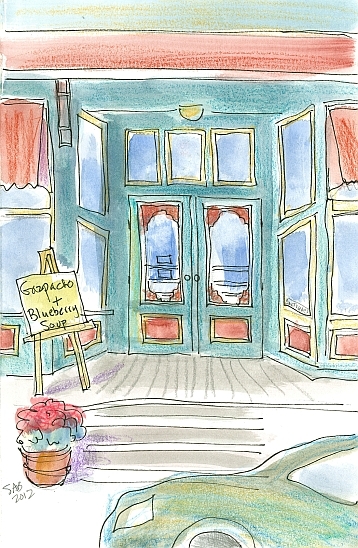 And coffee, gazpacho, and blueberry soup. Sounds good, and colorful too. The town of Freedom, with almost 1500 residents, took its name in 1831 when it broke away from the town to the south, Effingham. Here we are in Campton, NH, a town of 3400 people or so. It lies in the foothills of the White Mountain National Forest. 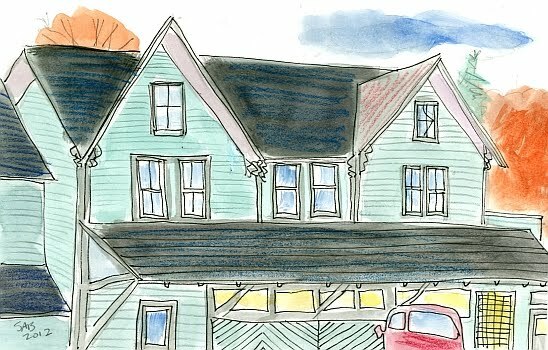 First of all, I drew this building because I was taken by the color. Pale aqua is one of my very favorite colors, and in a clothing store it draws me like a magnet. But it is an unusual color for a building, here painted wood. This is a general store with groceries and more. But notice the lack of any large signs. Nothing that tells you what is on sale this week. Or even a hint of all that might be inside. I drew the tiny sign that is above the door, on the very far right. 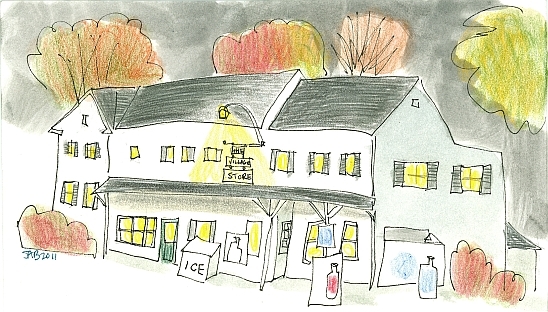 The sign says Crawford Notch General Store, but it is in the town of Hart’s Location, population 41 as of the 2010 census. It is a ribbon shaped town 11 miles long and 1.5 miles wide (18 km by 2.4 km), running along a valley in the White Mountains. It’s the smallest town in the state. New Hampshire state law allows a town of fewer than 100 residents (not just registered voters) to open its polls at midnight and close when all have cast their votes. 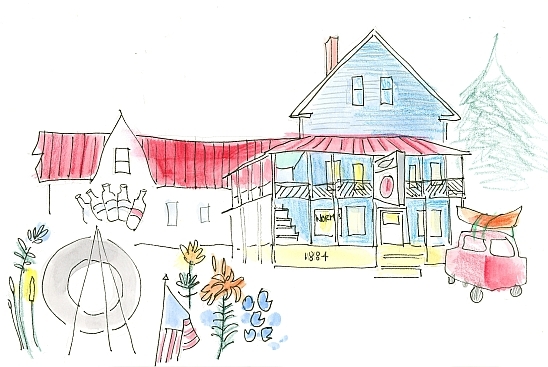 Therefore this small community, along with the neighboring Dixville Notch, gets a lot of attention during New Hampshire’s first in the nation presidential primaries for their early results. The building is a log cabin, with rugged decor....antlers, snowshoes, and wagon wheels. New Hampshire’s mountain passes are called notches, some say to echo the shapes cut into the logs for cabins. The mountain notches are Franconia, Dixville, Crawford, and Pinkham. The rock outcropping I drew is called the Frankenstein Cliff. In the middle of the drawing is the wire shed filled with firewood for campfires. There is a ban on importing out of state firewood, due to invasive nonnative insects. Atkinson, a town with a population of about 7,000, is on the border with the state of Massachusetts. We got lost and were in Massachusetts for an hour or so trying to make our way north again back into New Hampshire. As I have mentioned before, we travel with four maps and our GPS and still have our troubles finding our way around. This little store, under new ownership, was filled to bursting with beautiful flowers and plants. Mother’s Day was just around the corner, so the owners were in preparation for holiday purchases. The owners looked worried that I was outside for a long while, seemingly taking notes about their business. I went inside and explained that I was an artist, and harmless. 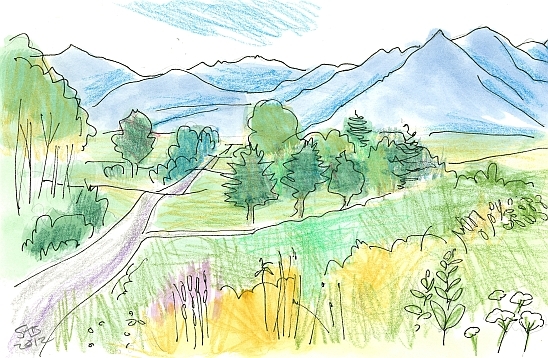 This led to my husband creating a ‘Get Out of Jail’ card for me, explaining my quest to draw all the towns in the state, which I now hand out to those who show a close interest in my activities. It is quite a busy road, and very narrow too. I drew from across the road, next to a granite post. The nickname for New Hampshire is the Granite State. It refers to the ubiquitous hard stone, and the toughness and resiliency of its inhabitants. Some stone posts have metal rings on them, leftovers from the days of tying one’s horse up at curbside. I was very careful where I stood to draw this image, as there seemed to be some very healthy poison ivy plants trailing over the stone wall. Poison Ivy is horrible stuff. It causes an itchy rash. Be thankful if you have never heard of it where you live. The building in the distance is the fire and rescue department. 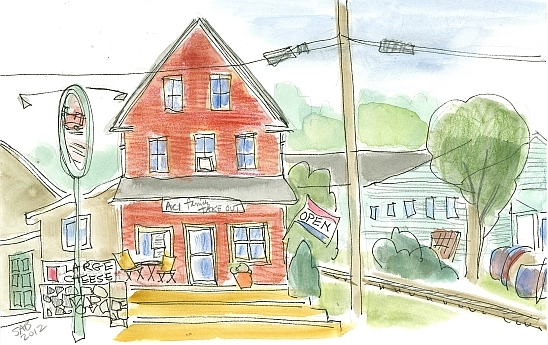 You can see the railroad tracks to the right, in this drawing of Newton Junction, a part of Newton, NH. I read that the Amtrak train goes by but doesn’t stop here anymore. The oval sign says “Trackside Professional Building”. And the sign over the door says ACI Family Takeout. This business is not quite a general store. But I think the shape of the building indicates to me that it once was. There’s that beautiful teal color again, on the old sheds to the right. Kingston, with a population of 6,000, was originally a part of Hampton, NH. And in 1694 it was granted status as a new town called Kingstown. The king involved was King William of England. The town green is rectangular and unusually long. 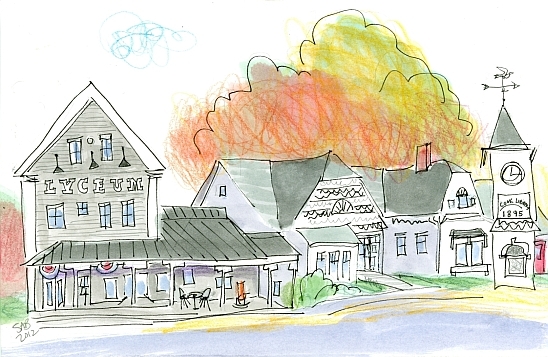 Early industries included shoe making in one-room shops and homes, silversmithing, and a rather extensive charcoal manufacturing industry that supplied many of the growing industrial cities of northeast Massachusetts. We stopped in here for some coffee at about 4 PM, when I need a pick me up. 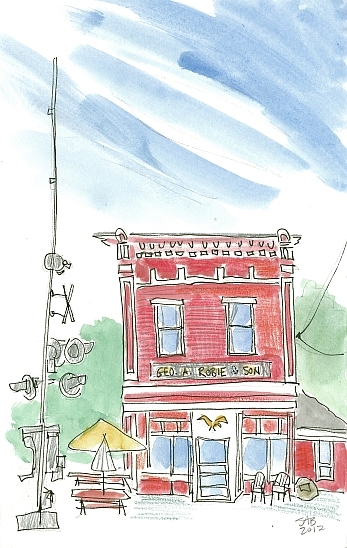 Then I stood out on the town common and drew this very vertical building. As is almost every structure in NH, it is painted wood clapboards. (In our family we pronounced this word as ‘clairboards’.) The signs say Kingston Country Store and Groceries and Lottery and Subs and Beer. And Power Ball, a multi-state lottery. Subs, or submarine sandwiches, are sandwiches made on long rolls as the word suggests. In the US there are over 20 regional names for this kind of sandwich. Where I grew up in Massachusetts, they were called grinders. I salivate as I type the word. This view is in the town of Jefferson, NH. And this section of town is called Jefferson Meadows. The mountains are the White Mountains of New Hampshire. This range is called the Presidential Range. The names are Mt. Washington, Mt. Adams, Mt. Jefferson, Mt Madison, Mt. Monroe, Mt Eisenhower, and some others named for notables of American history. The native people had their own names of course. When the mountains were first formed they got along well with no names at all. I put this drawing in as a little break from all the architecture. Milan, with the stress on the first syllable, is a small town. It is near the much larger town of Berlin, also with stress on the first syllable. I was struck by the unusual color combination in this storefront. The name sign is very new and modern, possibly plastic. I forgot to include the word ‘Inc.’ in the sign. Like almost every building in NH, it is constructed of painted wood, probably about 1900. There is a lot of granite quarries in NH, but most of the stone is shipped away and used in major metropolitan areas. Like Washington, DC. Or the capital city of Concord, NH. 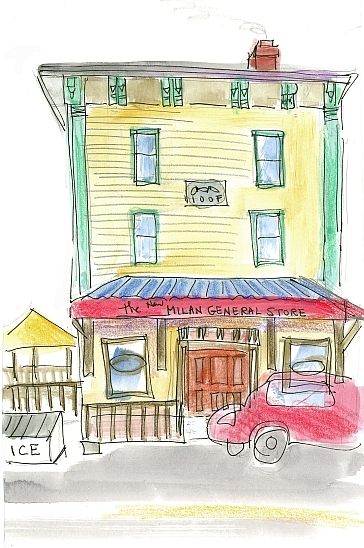 General stores are the traditional meeting places for the townspeople and those running for elected public office. The sign above the door says ‘Geo. A. Robie and Son’. The business was in this family for 110 years. It sits along the railroad tracks in the town of Hooksett, NH. It has been a stop for presidential candidates since the 1950s. The walls inside are lined with political buttons, photos, bumper stickers and the like. 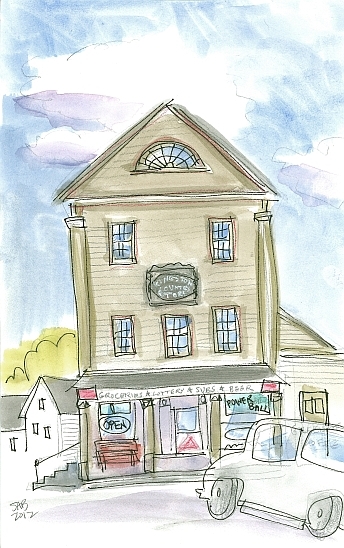 At one time the business received merchandise by barge from the Merrimack River, and also served as the town’s post office. We ate lunch here, and tried to remember past presidential campaigns and running mates. The names of the Vice Presidential candidates really fade into oblivion fast. To the left of the wooden structure are the railroad crossing lights and gate. Road level crossings are dangerous places when drivers try to beat the oncoming train. It was fun to draw however. Errol is a small town north of the White Mountains, with a population of perhaps 300. Like many, many towns in New Hampshire, the name goes back to some British gentry who never ever visited. In this case, the town was named for Scotland’s James Hay, 15th Earl of Errol. 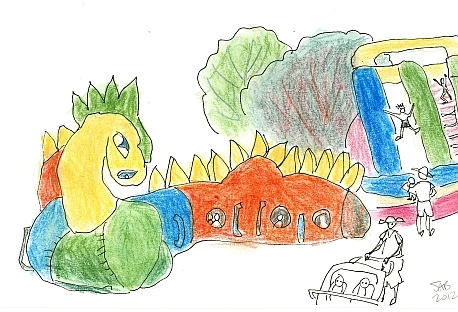 The drawing has a bit of twisted perspective. It was unintentional. I guess I moved my feet somewhere in the sketching process. It can be a hazard of on the spot drawing. I find the long addition colorful but oddly shaped. I liked the orange kayak on the red car. The flowers, flag, and round wreath (backwards to the viewer) are a small war memorial across the street. I was standing in the memorial park while drawing. Eaton is a small town, with a population of about 400. But it has a lot of heart. The residents saved their village store. And painted it ‘barn red’ again. It houses the post office, a grocery store, and a restaurant. We ate lunch there and visited with our friend. As soon as I started to draw, a gorgeous antique car pulled up. I had to sketch the car first, as I had no idea how long it was going to be posing for me. It stayed the whole time. Danbury NH is a town within a few miles of our home base of New London. It was not so easy deciding what to draw. When unsure, I tend to look towards a general store. It is a gathering place and meeting point. There is another general store across the street from this one, and I just heard today that this one has now closed. It was an unusual situation. Nonetheless, here it is, the (former) Danbury General Store. On the orange bench is a sign advertising Ragged Mountain, a ski resort in the town. It is 2,225 ft above sea level, or 678 meters. 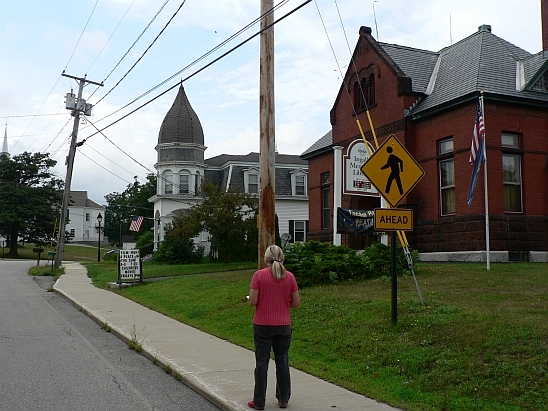 The Sunapee-Ragged-Kearsarge Greenway hiking trail runs through a corner of the town. 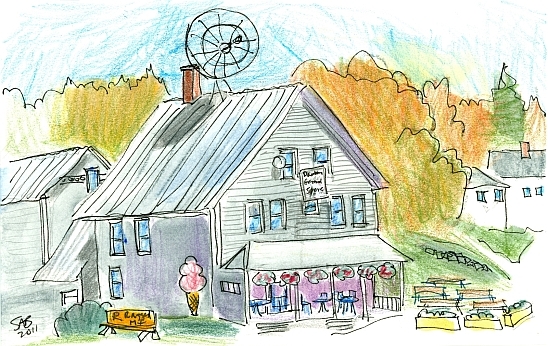 I love to draw large ice cream cone signs. It probably drew me to this view point. 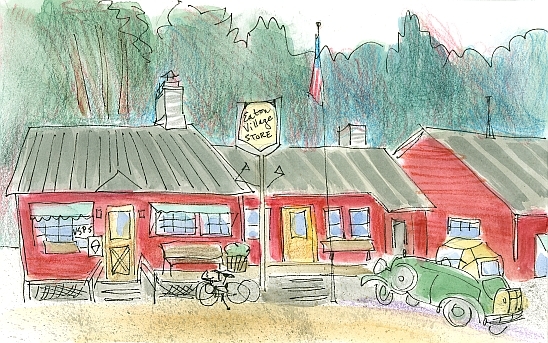 This is the general store in Lyndeborough, NH. It was dark by the time I stopped here as you can see. I liked the effect, and I don’t mind drawing in the dark. General stores often have a lot of additions to them. Probably this building started out as the far left section. Or maybe the far left and the far right were joined with the middle part. At this time, I was drawing in autumn, and it gets dark so early. Things are easier in the summer. We spent a fair amount of time in Tamworth last week. I popped into the library (the long white building on the right half of the page), and had a nice chat with some employees. And I showed them my Draw-NH sketches at their beginning stages. Which I don’t usually do. They were very encouraging people, and I hope they will log on and see this post. Then I checked out some books, knowing I can drop them off at my local library and they will be returned to this library by the state of NH book van. You can apparently do that anywhere in the state. Bruce took a nap. While I took a walk. We had a lovely dinner of local foods on the back deck of the Lyceum. New Hampshire has 21 playhouses, small professional repertory theatrical companies. 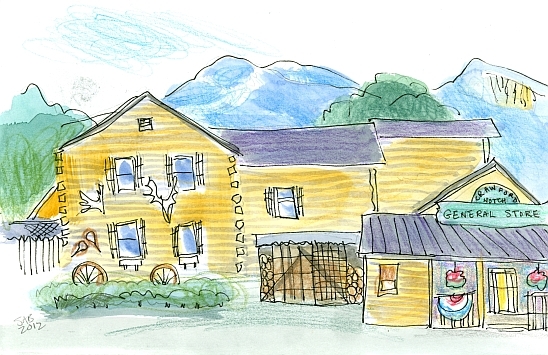 Our town, New London, has one called the Barn Playhouse, in a refurbished cow barn on Main Street. Tamworth’s playhouse is called the Barnstormers. They all appear to enjoy marvelous support from the townsfolk. One cannot see this view from a single location on the street. I drew it as I walked down the street to the right. Which is how you see things in your daily life, right? As I stood in front of the town offices drawing, a man asked me what I was doing. He was curious. I jokingly told him I was the town’s new meter maid, ready to write a ticket. And that I was prepared to stand there until the new parking meters were installed. A little joke...this town is so small that it has no need for meters or parking regulations (other than to control parking during Barnstormers’ performances). But I did give him a start for a second or two, and then a laugh. Ok, I admit it. I imagined the fall foliage behind all the white buildings. When we were there it was lush green. I know in my heart it will be these glorious colors. Today was Hospital Day in our town of New London, NH. Various activities raise money for our local hospital. This year some inflatable games for the children were sited on the town green. I just couldn’t resist drawing this large colorful dragon. There are several children playing inside it. To the right is a slide, with parents waiting at the bottom.